Boresighting the old-fashioned way — by looking down the bore of a rifle at a target — is not difficult. With a conventional bolt-action rifle, visual bore-sighting can be done quickly and easily: rest your gun securely on bags, remove your bolt and set up a 50-yard target with a large bright orange or black center circle. Look through the back of the action and you should be able to sight down the bore with your own eyes just fine. There’s no need for expensive hardware. In fact it may be easier to bore-sight the “old-fashioned way” rather than try to see a laser in bright sunlight at 50 yards (or even 25). However, with lever guns and semi-auto rifles, including the popular AR15, M1 Garand, and M1A service rifles, the design of the receiver may make it virtually impossible to sight down the bore with the naked eye. That’s where a modern laser bore-sighting device comes in handy. For those situations where a bore-sighting tool is actually needed, we recommend a laser bore-sighter that fits inside your chamber. The in-chamber configuration is more fool-proof, and is inherently safer. Among the laser bore-sighters available on the market, we strongly favor those that fit in the chamber, rather than in the bore. With muzzle-entry laser bore-sighters, you could have a nasty accident if you forget to remove the device. There is always the chance you could chamber and fire a round with the muzzle-entry bore-sighter still in place. Instant Kaboom. That has happened more than once. With an in-chamber bore-sighter, there is no possibility you could chamber a loaded round with the bore-sighter in place. That’s an important safety advantage. Sightmark in-chamber bore-sights are shown in the video below. 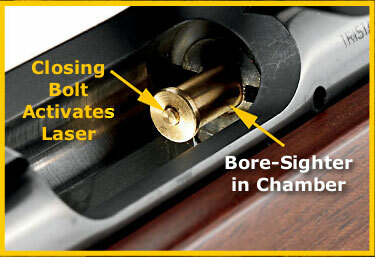 You can see that, with the bore-sighter in place, you cannot chamber a live round. Sightmark offers compact laser bore-sighters that fit inside your firearm’s chamber. The laser is housed in a brass assembly machined to duplicate a cartridge. These are easy to use — simply twist the end-cap to activate the laser, then place the bore-sighter in the rifle’s chamber. The affordable ($29.99 – $35.77) Sightmark boresighters are offered in a wide variety of pistol, shotgun, and rifle “chamberings”. Rifle options include: 17 HMR, .223 Rem, 22-250 30/30, .308 Win Family, .25-06/.270/.30-06, 6.5×55, .270/.300 WSM, .300 Win Mag, 50 BMG, and many other large hunting calibers. SEE Full Product Line. Cabela’s also offers a Professional .223 Laser Chamber Boresighter that fits in a .223 Rem rifle chamber. This $59.99 unit, shown below, can be adapted to other chamberings by adding a caliber-specific sleeve over the .223 core unit. Share the post "In-Chamber Laser Boresighters — Very Useful Tools"
Very handy for setting up a chronograph. I’ve not found it virtually impossible to boresite my at-15/msr rifles. I just separate the upper and lower, remove the BCG place my upper on my rest and look down the bore just like my turnbolts.